The 2018 NFL free agent class got another boost on as the Arizona Cardinals surprisingly released cornerback/safety Tyrann Mathieu. He’s had five excellent years in the league, doubling up at free safety and in the slot, while providing strong play in the three key areas of coverage, run defense and pass-rushing. Mathieu’s versatility makes him a perfect fit in today’s NFL as he’s able to cover slot receivers and play zone coverage, while sticking his nose in there against the run and in the short passing game with linebacker-like qualities. The Cardinals moved on from Mathieu after drafting Budda Baker in the second round last season, a player with a near-identical skillset who stepped right in with an 84.5 overall grade as a rookie. 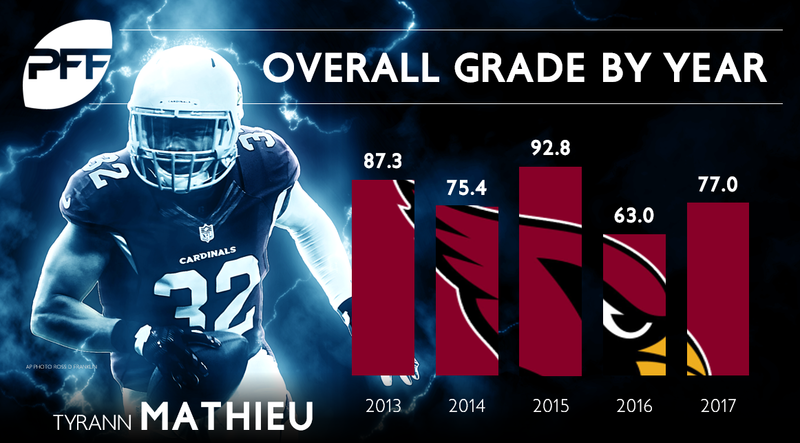 While Mathieu has taken a step back from his elite 2015 season that saw him grade at 92.8, he still has plenty to offer with his ability to play multiple roles at a high level. However, two ACL tears in five years may give teams some pause, especially given his declining coverage grade since his peak 2015 season. Let’s take a look at the good and the bad. Mathieu has always had a natural playmaking ability, whether he’s getting his hands on the ball, blitzing off the edge or finding a way to force fumbles. This is still a big part of his game and last year, many of his big plays came in the fourth quarter in crunch time. Here’s a Week 2 interception in overtime as he makes a quick break on the ball to create a turnover on the errant pass. Wrote up Tyrann Mathieu and what he offers to his next NFL team. Let’s start with his playmaking. He’s always had a knack for creating big plays dating back to his time at LSU. Here’s another play later in the season, similarly late in a close game. Mathieu is playing an underneath zone and does a fantastic job of reading Blake Bortles to turn his poor decision into an interception. Mathieu may do his best work closest to the line of scrimmage where he has a good feel for playing zone and his aggressive nature makes him an asset against screens and runs. Playing close to the line of scrimmage also takes advantage of Mathieu’s ability to rush the passer where he has feel for timing up blitzes, but he can also take on running backs in one-on-one situations. Here he beats running back Carlos Hyde for the sack. Mathieu has four sacks, eight QB hits and 36 hurries on only 175 rushes during his five-year career. Mathieu has always been an excellent blitzer, and he can beat running backs one-on-one. While Mathieu has playmaking ability in the slot, he’ll also give up his fair share of plays. His passer rating allowed in the slot has taken a plunge since 2015 when he picked off five passes and allowed a rating of only 70.3. He allowed a rating of 130.2 in 2016 and 91.6 last season. Even in the 2015 season, Mathieu allowed five touchdowns into his coverage in the slot, so he can be had by better slot receivers. Here’s a play from last season where Mathieu gets stuck at the top of the route and torched on a two-way go against Bruce Ellington. It’s a similar story on this play against Adam Humphries. Mathieu loses on a slick route by Humphries, leading to a big play in the middle of the field. While Mathieu’s versatility allows him to produce from a variety of roles on the field, he is not a guy that will line up in man coverage every snap and lock down opposing slot receivers. Last season, Mathieu played most of his snaps in the slot (696 out of 1,052), but he also spent 108 snaps close to the line of scrimmage at the linebacker level and another 175 snaps playing in a deep free safety role. He can affect the game at all levels of the field, though there should be some concern that his coverage grades have declined over the last two seasons. Mathieu can be had when matched up against good slot receivers in man coverage, so the best bet to maximizing his value is tapping into the versatility. Mathieu’s new defensive coordinator should tap into his linebacker mentality that allows him to make plays in the run game, force fumbles and get after the quarterback while excelling around the line of scrimmage. He can dabble at free safety in base packages and he’s played like a league-average slot corner when it comes to man-to-man situations, so that part of his game should be a piece rather than his primary role. Mathieu is one of the top players on the market, he’s still young despite the injuries, and he has the multi-layered skillset to excel in a defense willing to tap into his ability to create big plays all over the field.